Wealth management results drop slightly from last year for the firms 15,800 financial advisors. 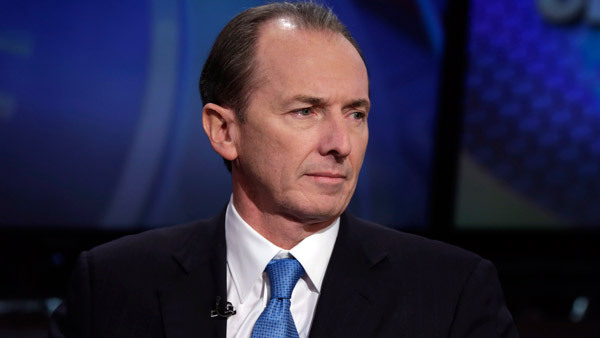 Morgan Stanley (MS) said early Monday that its third-quarter net income fell 60% to $1.02 billion, or $0.48 a share, from $1.69 billion, or $0.83, a year earlier. Excluding an accounting gain and legal expenses, it had a profit of $0.42 per share, which missed the $0.63 average estimate of 23 analysts surveyed by Bloomberg. While wealth management results weakened slightly, the company’s main loss was tied to private-equity investments in China and the firm posting what Gorman called the worst quarter for fixed income since the financial crisis. Its investment management revenue declined close to 60%, as the firm wrote off performance fees accrued by its Asia private equity business. “Morgan Stanley dropped the ball today. The miss is largely caused by lower IPO volumes, lower debt issuance, and volatility in Asian financial markets,” said Medy Agami, managing director at Opimas, a capital markets management consultancy. The wealth unit had net revenues of $3.6 billion in the most recent period, down 4% from last year and 6% sequentially. The group’s net pretax profit was $824 million, a decline of 3% from a year ago and 7% from the prior quarter. The pretax profit margin was 23%. The total number of financial advisors stands at 15,807, up 36 from Q2 but down 355 from a year ago. Total client assets are $1.9 trillion, down about 5% from Q2 and 4% from Q3’14. Yearly fees and commissions per FA are $922 million, a drop of 6% sequentially and 1% from the prior year. Average assets per FA are $122 million, down 5% from the earlier quarter and 2% from a year ago. Client loans were $61 billion in Q3, up 5% sequentially and up 27% from last year. Fee-based asset flows, though, declined to $7.7 billion vs. $13.9 billion sequentially but rose from $6.5 billion a year earlier. Bank of America Merrill Lynch (MAC) reported last week that its advisors have average yearly fees and commissions of $1 million. The wealth unit had sales of $4.5 billion in Q3. — Check out Financial Firms’ Q3 Earnings Seen Nearly Flat, at Best on ThinkAdvisor.